Designed for plug-and-play connectivity on any Mac, PC, or Linux system supporting USB 3.0 input infrastructure, the CV502-U3 uses video capture drivers included with common computer software and soft codecs. Through the use of UVC 1.5, common teleconference and video capture programs can adapt best resolution and frame rate for optimal performance. Marshall also offers free downloadable software for manual adjustment and control where applications require it. Using the same sensor and processor as the Marshall CV502, CV505, and CV565 miniature cameras, the CV502-U3 delivers up to 1080p resolution at 60/59.94/50 frame rates. With a low 0.2 lux (color) rating, the CV502-U3 captures accurate, sharp color images even under low-light conditions. The CV502-U3 ships with an ultra-wide 2.3mm 126-degree Angle-of-View (AOV) HD lens that is interchangeable to customize for specific applications. 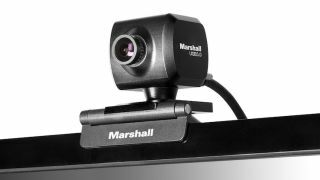 Marshall offers a wide assortment of lens options for a fully customizable AOV and focal length per camera position within an installation. The CV502-U3 is equipped with an adjustable, heavy-duty monitor/desk mount that can be adapted to any installation using common 1/4-inch-20 tripod interface. Well suited for use as a permanent fixture in huddle rooms and conference rooms, the CV502-U3 includes a 6.5-foot USB 3.0 cable with thumbscrew locks, allowing multiple users to operate the camera without having to set it up for each session. The CV502-U3 is designed to offer the connectivity, performance, and reliability required for huddle rooms and web streaming applications with professional adjustment settings, interchangeable lenses, and secure mounting options. The CV502-U3 will be available for early purchase by mid-December 2017, with a full rollout to come in January 2018.